ANC is 1000 and no more fevers!We are discharged - but not until the hospital staff came in and threw confetti in our faces and sang Happy Birthday to him! 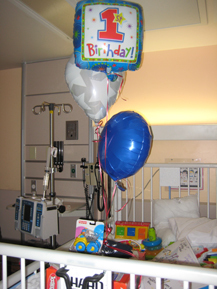 They gave him toys and balloons and a signed poster from all the nurses. He's also sporting his first bottom left tooth now !!! Big week for our boy. 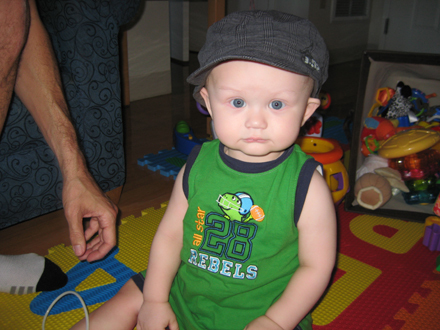 HAPPY BIRTHDAY BABY - your 1!!!! God's got his Hands on you my love. I sure didn't want to have your birthday in a hospital, but I am so grateful and thankful to God that you are having a birthday and it doesn't matter where! When we finally go home we will give you a real Birthday Party - I can't wait to take you home Baby Nicholas! You have been so very strong my son and we love you so very very much! Tomorrow is the big day! Please Father give us our miracle and keep his scans clear and stable so we can pack up and go to Jacksonville for the next part of treatment!! !